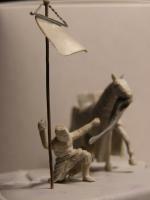 We have just finished this master of a knight kneeling, what do you think? 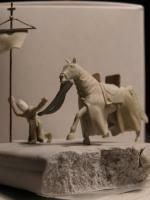 The Horse should rest too , it seems to walk , possible , but a very special Moment to realize in a Diorama . This looks nearly like the moment at the second crusade as Richard the lionhearth and his army fist saw the city of Jerusalem. Many of them felt on their knees and prayed. This would be just the figure for this moment. 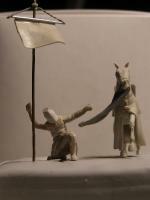 But as Andreas said, the Horse have to stand. maybe shaking his head or so? When the Knights first saw Jerusalem was in my Mind too ... i thougt about the 1st Crusade . I´m a bit confused about Richard . He was one of the Leaders of the 3 rd Crusade and he never saw Jerusalem . Well yes, Richard did reach Jerusalem but never attacked or entered the city. This was actually also when the allience with the French King began to break. BBC did a series "Heroes and Villians" and I can highly recommend the one with Richard The Lionheart. Thanks, hope that he will be available in January or beginning of February. 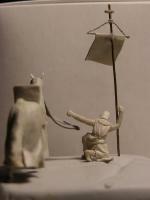 will you keep your idea of this moment or turn it into a praying knight? Both ways are very interresting. Well initially it will be as on the image, when casted I might make a conversion later. Just do both...both poses would be equally usefull. i agree , maybe you think about a standing Horse ? 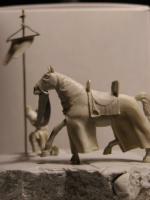 Yes, I am considering to do a standing horse instead or simply make the set with two horses?